The Stirling Smith has a number of works by the Stirling based artist Henry Morley (1870-1937), and in 2004 mounted a major exhibition on his life and work. Born in Nottingham, his art studies took him to Paris, where he studied at Julian’s Academy and fell in love with Stirling artist Isobel Hutchison, daughter of Andrew Hutchison, Rector of the High School of Stirling. He followed Isobel to Joseph Denovan Adam’s School of Animal Art at Craigmill, near Cambuskenneth. They married in 1901, and set up home in Stirling, commissioning and building ‘The Gables’ (now in Borestone Crescent) as their home and studio. 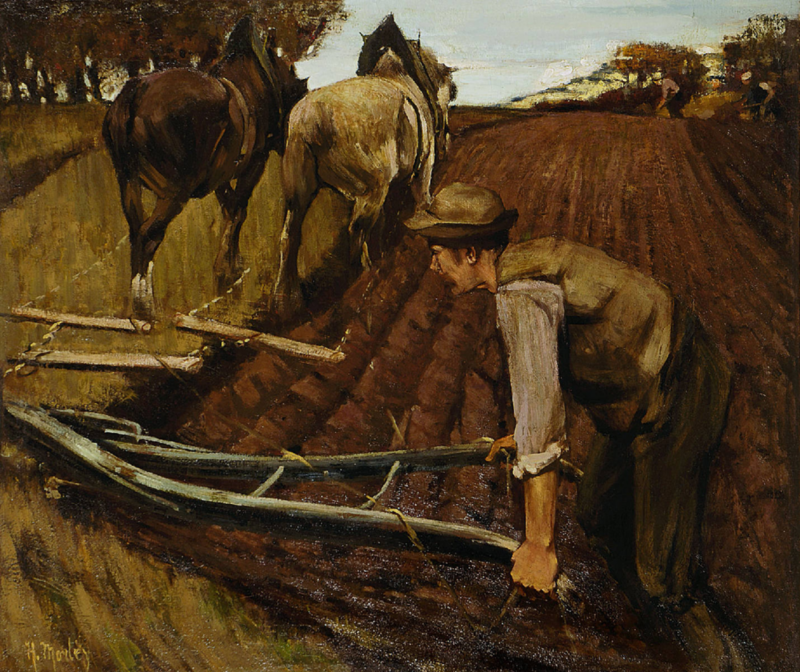 Morley’s subject matter was the landscape of the Stirling area, and the agricultural seasons of ploughing, sowing, harvesting and hay making. His studio overlooked the picturesque village of St Ninians, with Stirling Castle beyond, and he painted this scene many times. The Stirling Ploughman is painted from the same viewpoint, but Stirling Castle is barely suggested in the top right-hand corner of this work, where all the visual emphasis is on the ploughman and his horses. The work is very different to the paintings in the 2004 exhibition, suggesting that other work and styles by him have yet to be discovered. This painting, a recent purchase, was discovered by Dr Robin Campbell in an auction house in Germany last year and was secured with funding from the Friends of the Smith.